Somewhere in the recent past, society took a turn and a long-standing holiday tradition was transformed into a joke. So complete was this societal change that those daring to speak up for or defend fruitcake were virtually stoned by an angry mob. Fruitcake lovers were outcast, rejected and ridiculed by popular culture. So vitriolic was the anti-fruitcake feeling that those with differing views were forced to quietly seek out others who, like them, still appreciated the fruitcake. Soon, the outcasts began to find each other, and so, the fruitcake subculture was formed. It may surprise you how many people number themselves among the Fruitcake Underground. Just tell a fruitcake joke to a group of people and carefully watch the reactions. Oh yes, there will more than likely be one or more people in the group laughing nervously, trying to blend in without making a scene, wondering if anyone will ever come to the rescue of the defamed fruitcake. Other evidence is the amount of fruitcake out there in the world, and it is spreading. Right now, someone somewhere (maybe even someone you know) is enjoying a dense, moist piece of fruit-and-nut-laden, spirit-drenched cake behind closed doors, and probably feeling a little guilty about it. I can tell you, after extensive research, that the movement is about to come out of the basement. Fruitcake is about to become the next great thing in the world of special occasion food items. The movement has firm roots in many areas of food manufacturing and marketing, as well as suspected endorsements from many famous chefs and food critics. 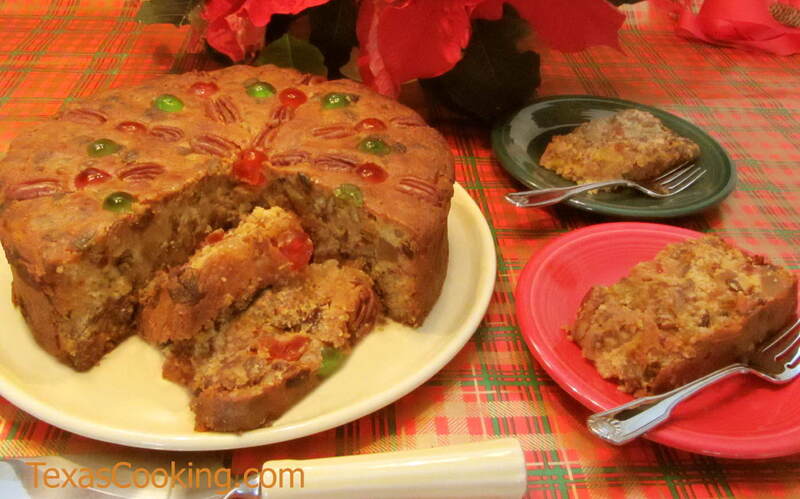 That's right, fruitcake is on its way back in, so grab some fruitcake recipes and let's go! It's almost conspiratorial the way everything is falling into place. Have you noticed the abundance of dried fruits available in your local markets these days? Not your nuclear green candied fruit substances, but real dried fruits. They are even putting them in the cereal to get you acclimated to them. And where did the dried cranberries come from? It's all part of the plan. The next step is to gain broad acceptance by changing the name. Let's face it. The term "fruitcake" has all kinds of negative associations. But what about Jack Daniels Bourbon Cake? Or Meyer's Rum Cake? Yesterday, I saw the first of these commercially marketed fruitcakes in the holiday section of the gourmet grocery store in my town. What can you do to stop it? It's too late to try - it's already gone too far. So just embrace it; give it a try. Who knows, you may actually like some of these cakes. The new cakes blend the best of the new world with the best of the old world. Gone are the crazy candied fruits, and in are the modern dry fruits. Don't hide this in your closet anymore. Dice it up into small squares and dip it into chocolate for some delicious treats. With the outstanding shelf life built in to a fruitcake, what do you have to lose? Use a variety of nuts - walnuts, pecans, hazelnuts, almonds, macadamias. In a plastic container or zip-lock bag, soak the dried fruit in ¼ cup of the rum for at least a day, covered tightly and at room temperature. Then preheat the oven to 325 degrees F. Butter and line a 6-inch round pan or 4 x 8½ inch loaf pan with parchment paper. Whisk together the flour, baking powder, salt and cinnamon. Cream the butter and sugar until fluffy and add the eggs, one at a time. Add the flour in three batches, alternating with the milk and molasses. Stir in the fruit/rum mixture and chocolate and/or nuts. Pour into prepared pan and bake for 55 minutes to 1 hour. Let cake cool in the pan for 10 minutes, then sprinkle with 2 tablespoons of rum. Place a piece of parchment paper, large enough to wrap entire cake, on a flat surface. Moisten a piece of cheesecloth, large enough to wrap the cake, with 1-tablespoon rum. Place the cheesecloth on top of the parchment paper, and unmold the cake on top of it. Sprinkle the top and sides of the cake with the remaining rum. Wrap the cake, pressing the cheesecloth closely to the surface of the cake. Place the cake in an airtight tin (or plastic container, and let age for at least 4 weeks. If storing longer, douse with additional rum for every 4 weeks of storage. Substitute the following fruit; 2/3 cup dried pineapple cut into small chunks, 2/3 cup diced mango, 1/3 cup diced papaya, 1/3 cup coconut, 2/3 chopped macadamia nuts and use Malibu rum instead of regular rum. 2/3 cup dried strawberries. 2/3 cup dried raspberries. 1/3 cup dried blueberries. 1/3 cup currants, 1/3 cup dried cranberries and use Kirsch (cherry flavored liqueur) instead of rum. 2/3 cup dried diced peaches, 2/3 cup dried blueberries, 2/3 cup chopped pecans and use a good Whiskey or Bourbon.